KEALAKEKUA, Hawai'i: Civil Defence personnel and residents of the “Big Island” of Hawai‘i were today still assessing the extent of the damage that happened during this morning's tsunami in the wake of the catastrophic earthquake off Japan, which hit the island around 4 am. Beaches were swamped and low-lying areas flooded throughout the Hawai'ian Islands after the tsunami, spawned by an 8.9-magnitude earthquake in Japan, raced across the Pacific and surged onto Hawai'i’s shores. 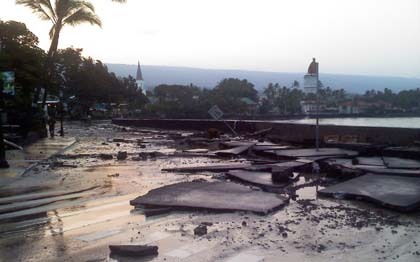 Most of the damage, however, appears to have been centered on the west-facing coast of Hawai‘i Island, particularly in Kailua-Kona and the Kealakekua Bay area, where water rushed onto roadways, tumbling cars, damaging coastal buildings, and in at least one case, sweeping an entire house off its foundations and into the sea. The house is still, at press time, floating in Kealakekua Bay. There were no reports of injuries or deaths at this time. Beginning at about 10 pm Friday night (Thursday, Hawai'i time), warning sirens went off and thousands of people were evacuated from homes and businesses. By late Saturday (Friday) morning, most residents were able to return to their homes, but the evacuation order remained in place, and roads remained closed, into the afternoon for the heavily damaged areas of South Kona. In Kailua-Kona, the main town in the Kona district, the King Kamehameha Kona Beach Hotel sustained heavy damage to the lobby and other areas and will be closed for at least 3 months for repairs. Several waterfront restaurants and businesses also face weeks or months of post-tsunami cleanup and repair. This tsunami event is the second time in 13 months that Hawai‘i has been threatened by a potentially destructive tsunami. On February 27, 2010, a magnitude-8.8 earthquake in Chile sent waves racing north and sparked widespread warnings across the Pacific, but in that case the waves produced were much smaller than predicted, and resulted in minor damage. Coincidentally, a 4.5-magnitude earthquake struck the Big Island just before 11 pm Thursday night as evacuations were proceeding and the island’s residents were anxiously awaiting news of the tsunami’s approach. There are no reports of damages from the quake.